Hello, up for auction is the beautiful authentic historic period Victorian silk dress. This is not a reproduction. I am not sure of the exact date on this, it was a purchase online which stated the dress is from somewhere on the 1880s. This auction is for a silk pinstriped bodice and under/over skirt. The black bustle is not included as it is not part of the original dress. The dress when purchased never came with the original bustle. Both bodice and skirt are very damaged. I have taken over 20 photos for the potential bidder to view. I included the most damaged parts of this dress. It is basically not wearable, and should be considered for purchase as a collector's item. It probably can be worn but it must fit exact to the body measurements this dress was made for and just know the dress is in a very fragile condition and the silk might tear more. It is very petite. Height would work best for someone 5'6 to 5'8. Bust measurement of bodice is 30", waistline of skirt 24" and hips up to 36". Some parts of the bodice and skirt were repaired by me. I show the repairs on my photos. I added some new buttons to the bodice that were missing, I repaired some of the holes with black raw silk, I added some hook and eye closures to the inside bodice lining and skirt lining (which was holding the black bustle on). These I am leaving on and including with this dress when shipped. The basque waist and the narrowness of the skirt are the two clues to the earlier date. 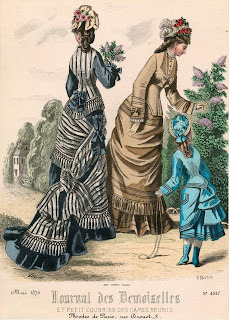 Also, this color combo - as evidenced above in the fashion plates- was a popular one in the mid 1870's. I'm not sure about that one - it's hard to tell the skirt shape without the correct underpinning. 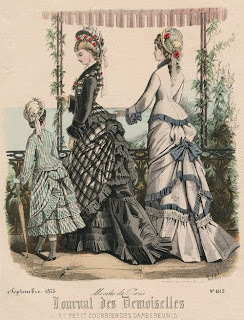 I could definitely see this as 1883-1886, there are some (if a minority) of longer bodices there too. I wish I could see the cut of the sleeves better - is there a cuff? I don't think so. Either way, I love the criss-cross detail at the bust.